Qubox supply an array of patio and garden gazebos, shelters and canopies to suit most requirements. From polycarbonate gazebos to retractable pergolas, from a folding gazebo to permanent timber gazebos, Qubox has it covered. 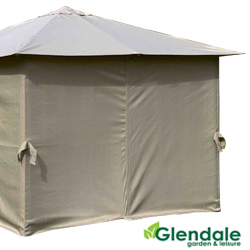 Here you will find wooden gazebos, aluminium gazebos, steel gazebos and shelters for hot tubs from top brands such as Glendale Leisure, Norfolk Leisure, Royal Craft and Rowlinson. All of our garden canopies come with Free Mainland delivery across the UK. Give the team a call should you have any questions.